WESTPORT, Conn., Jan. 7, 2019 — The Law Offices of Edward Nusbaum today announced Harold “Rusty” Haldeman partner. A veteran of handling numerous family law cases, Haldeman provides more than 20 years’ experience in matters involving divorce, property division, child custody issues, premarital and postmarital agreements, and a variety of other issues. Since joining the firm, his principal roles have involved discovery, management, research and preparation of briefs for trial and appellate cases, preparation and analysis of financial documents, preparation for depositions, pre-trial evaluations, mediations, arbitrations and trials. Adept at guiding clients through the complex process of preparing essential documents and responding to financial discovery typical in high-asset cases, Haldeman also manages the intake, cataloguing and analysis of the same documents and discovery from opposing counsel, methodically synthesizing vast amounts of financial information to provide concise, informative data for settlement or trial of the case. He works on all types of family law matters, including divorce, alimony, child support, property distribution and child custody, including preparation of pleadings, separation agreements, parenting plans and proposed orders for pre-trial and trial. In fact, Haldeman’s pre-trial documentation, unofficially known by Connecticut judges as “Rusty’s Notebook,” has been recognized by numerous family law judges as the best resource trial document in the profession, according to Edward Nusbaum, principal of the firm. Prior to joining Nusbaum’s law firm, Haldeman served in the United States Navy as a Surface Warfare Officer, and, after attending law school, as a member of the Judge Advocate General’s Corps. Among his assignments as a judge advocate, he served as Legal Officer of the USS NIMITZ (CVN-68), Staff Judge Advocate for the Naval Base at Guantanamo Bay, Cuba, and, for eight years, as a Military Judge in the Navy Marine Corps Trial Judiciary. During his service, he received the Navy Achievement Medal, Navy Commendation Medal, Meritorious Service Medal and Legion of Merit. Haldeman is a recipient of an American Jurisprudence Award. He is co-author of, “A History of the First One Hundred Years of the Connecticut Bar Association,” published in the Connecticut Bar Journal. During his time as a Military Judge he was the originator of the Navy-Marine Corps Trial Judiciary Electronic Bench Book, and the author of Lex Novissima Loquitor, a periodical keeping the worldwide Navy Trial Judiciary abreast of changes in military case law. Both, at the time, represented singular applications of new technology to improve the efficiency and accuracy of judges’ preparation for trials ashore and at sea. He also lectured on application of technology at the Naval Justice School’s Military Judges Course. Haldeman is admitted to practice in Connecticut. He earned a bachelor’s degree in history from Williams College and a Juris Doctor degree, with honors, from the University of Connecticut. He is a member of the American Legion, the Military Officers Association of America and the Navy Marine Corps Retired Judge Advocates Association. WESTPORT, Conn., Dec. 3, 2018 — Edward Nusbaum, a Westport-based family law attorney, was recently selected by his peers for inclusion in Best Lawyers™ New York Area 2019 for family law. He has been recognized by Best Lawyers® since 1995 and ranks among the top five percent of private practice attorneys nationwide. Attorneys listed in Best Lawyers were selected after an exhaustive peer-review survey that confidentially investigates the professional abilities and experience of each lawyer. Recognition in Best Lawyers is widely regarded by both clients and legal professionals as a significant honor. Lawyers are not required or allowed to pay a fee to be listed; therefore, inclusion in Best Lawyers is considered a singular honor. Nusbaum has been practicing family law in Westport for more than 35 years. He has been a Martindale-Hubbell AV Preeminent-rated attorney for 25 consecutive years and been named a Connecticut Super Lawyers Top 50 attorney by Thomson Reuters. In November, the Law Offices of Edward Nusbaum P.C. was ranked by U.S. News & World Report and Best Lawyers as a 2019 Best Law Firm in the category of Metropolitan Tier 2 Stamford for family law. Since it was first published in 1983, Best Lawyers has become universally regarded as the definitive guide to legal excellence. Ninety-one thousand attorneys from around the world are eligible to vote. Best Lawyers has received more than 10 million evaluations on the legal abilities of other lawyers based on their specific practice areas. For additional information about methodology please visit: Best Lawyers methodology. Best Lawyers is the oldest and most respected attorney ranking service in the world. For more than 30 years, Best Lawyers has assisted those in need of legal services to identify attorneys best qualified to represent them in distant jurisdictions or unfamiliar specialties. Best Lawyers lists are published in leading local, regional and national publications across the globe. Best Lawyers™ New York Area 2019 is a special advertising supplement to The New York Times and The Wall Street Journal. WESTPORT, Conn., Nov. 27, 2018 — Family law attorney Edward Nusbaum was recently selected a founding member of the American Academy for Certified Financial Litigators’ Connecticut chapter. Additionally, Nusbaum also became a member of the National Board of Trial Advocacy. The American Academy for Certified Financial Litigators, a New York-based organization for prominent attorneys who work with high-net-worth individuals, is a national educational institution dedicated to enhancing the legal profession through advanced financial education. Its mission is to provide innovative financial training programs designed to increase the financial knowledge of attorneys dealing with financial issues in their practice. AACFL membership indicates a significant commitment to the community by improving the efficiency of the court system through advanced financial education for attorneys. Additional benefits include greater efficiencies for their clients, effective financial strategies and reductions in avoidable court time. In addition, Nusbaum joined the National Board of Trial Advocacy as a family trial advocate and a family pretrial advocate. The NBTA is accredited by the American Bar Association to certify lawyers in the specialty areas of civil trial law, criminal trial law, family trial law, civil practice law and social security disability law. The NBTA is dedicated to bettering the quality of trial advocacy in the nation’s courtrooms and helping consumers find experienced and highly qualified trial lawyers. The Law Offices of Edward Nusbaum P.C., located at 212 Post Road West in Westport, Conn., represents individuals with substantial assets in all areas of family law matters, including divorce, alimony, child support, property division, child custody and relocation cases. A significant portion of the firm’s work is concentrated in Fairfield County, yet its geographic reach often extends throughout the state. For additional information on the Law Offices of Edward Nusbaum P.C., please visit its website at http://www.nusbaumfamilylaw.com/ or call 203-226-8181. WESTPORT, Conn., Nov. 1, 2018 – The Law Offices of Edward Nusbaum P.C. has been ranked by U.S. News & World Report and Best Lawyers as a 2019 Best Law Firm in the category of Metropolitan Tier 2 Stamford for family law. This is the ninth consecutive year these rankings have been announced and the ninth year Nusbaum’s firm has earned this recognition. The Stamford metro area includes Bridgeport, Darien, Fairfield, Greenwich, New Canaan, Norwalk, Ridgefield, Southport, Stamford, Weston, Westport and Wilton. Nusbaum, who was recognized in The Best Lawyers in America© for 2019 earlier this year, has been practicing family law in Westport for more than 35 years. He has been a Martindale-Hubbell AV Preeminent-rated attorney for 25 consecutive years and been named a Connecticut Super Lawyers Top 50 attorney by Thomson Reuters. He also has been rated Best Lawyers in America for 25 consecutive years and ranks among the top five percent of private practice attorneys nationwide. 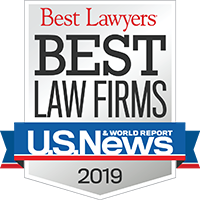 Firms included in the 2019 Best Law Firms list are recognized for professional excellence with persistently impressive ratings from clients and peers. Achieving a tiered ranking signals a unique combination of quality law practice and breadth of legal expertise. The 2019 rankings are based on the highest number of participating firms and highest number of client ballots on record. To be eligible for a ranking, a firm must have a lawyer listed in The Best Lawyers in America, which recognizes the top five percent of practicing attorneys in the U.S.
Over 16,000 lawyers provided more than 1,125,000 law firm assessments, and almost 12,000 clients provided more than 107,000 evaluations. The 2019 Best Law Firms rankings can be seen in their entirety by visiting http://bestlawfirms.usnews.com/. For additional information on methodology, please visit, https://bestlawfirms.usnews.com/downloads/BLF-Expanded-Methodology-2018.pdf. WESTPORT, Conn., Oct. 22, 2018 — Lawyers of Distinction today announced Edward Nusbaum, a Westport-based family law attorney, has been certified as a member. Lawyers of Distinction is recognized as the fastest growing community of distinguished lawyers in the United States. Lawyers of Distinction limits membership to 10 percent or less of attorneys in any given state. Members are accepted based upon objective evaluation of an attorney’s qualifications, license, reputation, experience and disciplinary history. Please visit Lawyers of Distinction for further details concerning membership qualification. Nusbaum, recognized in The Best Lawyers in America© for 2019, has been practicing family law in Westport for more than 35 years. He has been a Martindale-Hubbell AV Preeminent-rated attorney for 25 consecutive years and been named a Connecticut Super Lawyers Top 50 attorney by Thomson Reuters. He also has been rated Best Lawyers in America for 25 consecutive years and ranks among the top five percent of private practice attorneys nationwide. Lawyers of Distinction uses its own independent criteria, including both objective and subjective factors in determining if an attorney can be recognized as a Lawyer of Distinction in the U.S. in their respective field. This designation is based upon proprietary analysis by the Lawyers of Distinction organization alone and is not intended to be endorsed by any of the 50 U.S. state bar associations or the District of Columbia Bar. WESTPORT, Conn., Oct. 18, 2018 — Edward Nusbaum, a Westport-based family law attorney, has been selected to the 2018 Connecticut Super Lawyers list. No more than five percent of lawyers in the state are selected by Super Lawyers. Nusbaum has had the distinction of being named a Connecticut Super Lawyer every year since 2006. Super Lawyers, part of Thomson Reuters, is a rating service of outstanding lawyers from more than 70 practice areas who have attained a high degree of peer recognition and professional achievement. The annual selections are made using a patented multiphase process that includes a statewide survey of lawyers, an independent research evaluation of candidates and peer reviews by practice area. The result is a credible, comprehensive and diverse listing of exceptional attorneys. Detailed information on the selection process is available at https://www.superlawyers.com/about/selection_process_detail.html.